Offering a fitness room, an indoor pool, and comfortable king-size beds, The Hampton Inn Clovis is situated 10 minutes’ drive from Clovis’s center. Guests can enjoy the hotel’s free hot breakfasts. Each room at The Hampton Inn Clovis features cable TV, along with a refrigerator and coffee maker. Guests can also make use of a complimentary newspaper, free Wi-Fi, and hairdryers. A variety of daily breakfast items are served, along with unlimited juice and coffee. Guests in a hurry can take one of The Hampton Inn’s On the Run breakfast bags. Free parking is available at The Hampton Inn Clovis, and the famous Norman Petty 7th Street studios, made famous by Buddy Holly and Roy Orbison, are 10 minutes’ drive away. The Blackwater Draw museum and Archaeological Site can be reached in a 15 minute drive. 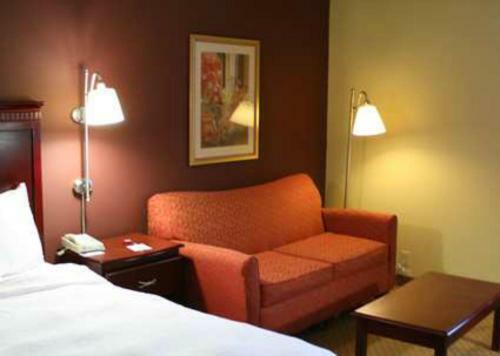 the hotel Hampton Inn Clovis so we can give you detailed rates for the rooms in the desired period.